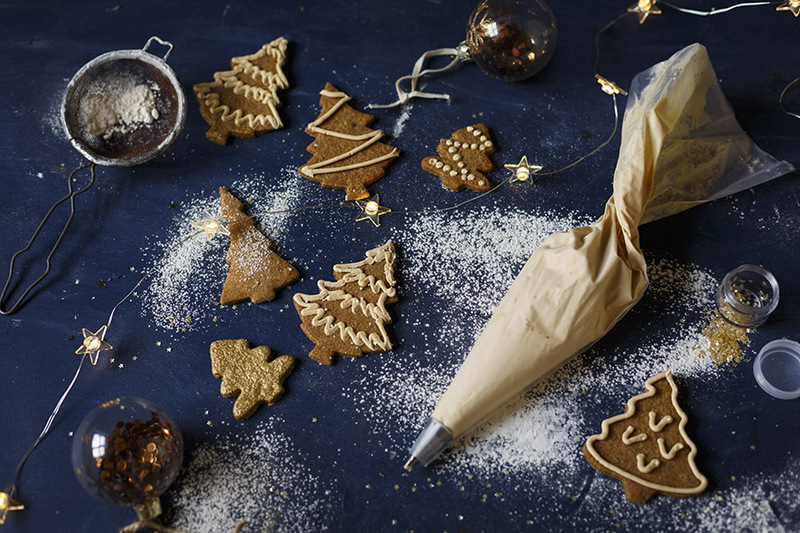 Why buy Christmas tree ornaments when you can make them yourself, and then eat them?! This was the very epiphany I had last week when after moving into a new house I suddenly realised I had nothing to decorate a tree with (in my spring-cleaning chuck-everything-away state they were tossed in the bin). But if you’re a baker, who needs glass/plastic baubles when you can make your own which coincidentally look and ARE good enough to eat. My infatuation with macarons continues this year (I tried to convince you all last year to give them a bash with this Christmas mince pie macaron version) with my spiced gingerbread macaron – which I might add, if Christmas had a taste, would taste like this! 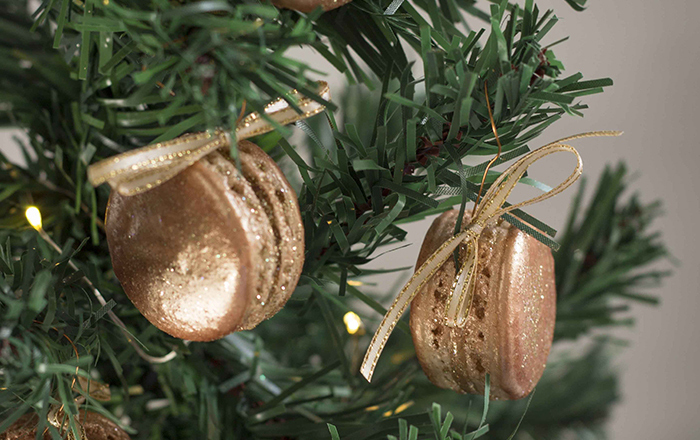 And with the beautiful edible copper, gold and silver dusts and glitter you can buy these days, it’s super easy to add sparkle to your tree. Hang them up and after Christmas dinner, when the family asks where’s dessert? Channel your inner Heston Blumenthal and just point to the tree! 2. Beat the egg whites until very stiff – they should form very stiff peaks. 3. Fold until the mixture looks like lava – it should ooze when dropped from your spoon. 4. Check your oven temperature! 5. Bake on the lower third rack of your oven. Line 2-3 baking sheets with good-quality baking paper or even better, silicone sheets. 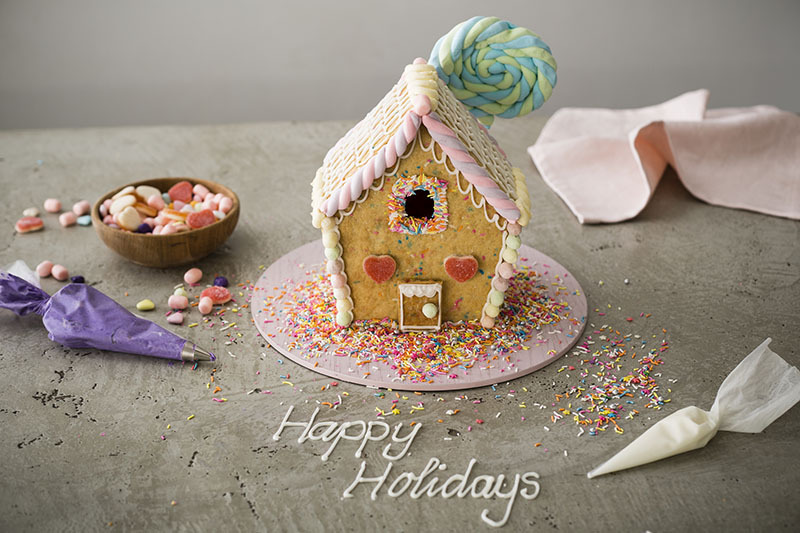 Using a tot glass, trace circles onto the baking paper then flip it over – you’ll need these as a sizing guide (unless your piping skills are of Martha Stewart quality! 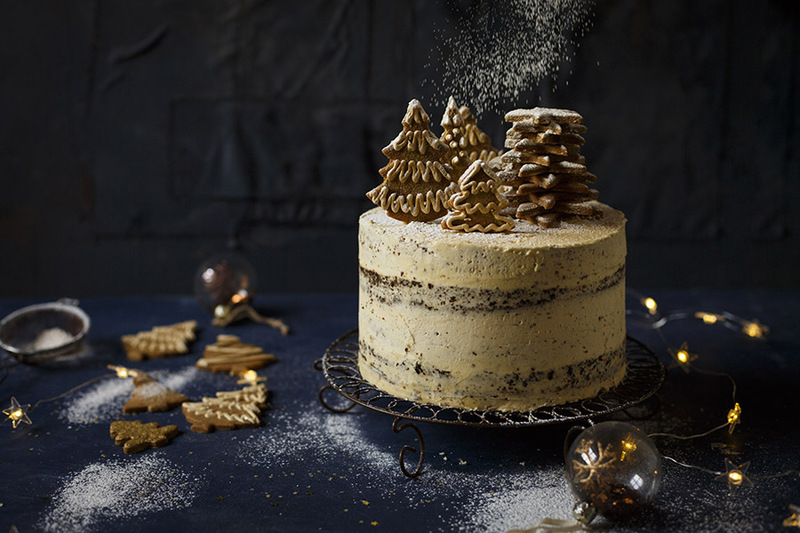 )Blend the almonds, icing sugar and spices together until fine. Sift the mixture to remove any clumps then blend any leftover mixture and sift again until nothing remains. Begin beating the egg whites and cream of tartar on low speed. Once the egg whites are very foamy and white, begin sprinkling in the sugar as you beat. Increase the speed to medium, if necessary, and beat the meringue to very stiff glossy peaks. The meringue should be very firm. Add about 1/4 of the almond/sugar mixture and fold until no streaks remain. Continue to add the almond mixture in quarters, folding until incorporated. The mixture should be a lava consistency so when dropped, it should start spreading and oozing. Spoon the batter into a piping bag and pipe rows of batter onto the baking sheets using the circles as a guide, giving them enough space to spread. Tap the pan on the counter to bring up any air bubbles and quickly pop them with a toothpick if necessary. Allow the cookies to rest on a level surface for 30-60 minutes until they are no longer tacky to a light touch. This is a very important step so don’t be tempted to be impatient! While they rest, place an oven rack in the lower 3rd of your oven and preheat to 150C (conventional oven, if fan-forced, reduce by 20C). Check your oven isn’t too hot or too cold by using an oven or sugar thermometer. Bake the cookies for 16-20 minutes. They’re ready when you lightly touch them and they no longer have any ‘give’. Make the ganache by heating the cream and orange peel together until just simmering. Set aside for 1 hour to infuse before heating again and pouring over the white chocolate. Stir until melted then mix in the spices and allow to set until spreadable. Sandwich the macarons together with the ganache. 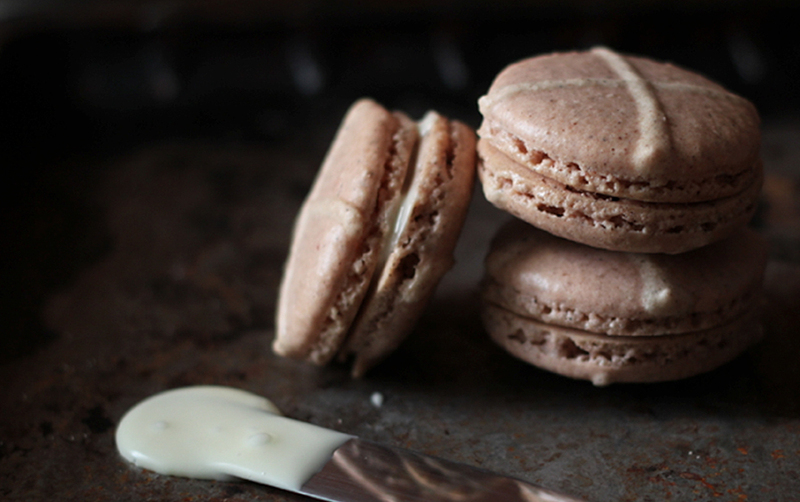 Using a clean soft paint brush, coat the macarons with edible copper or gold dust. 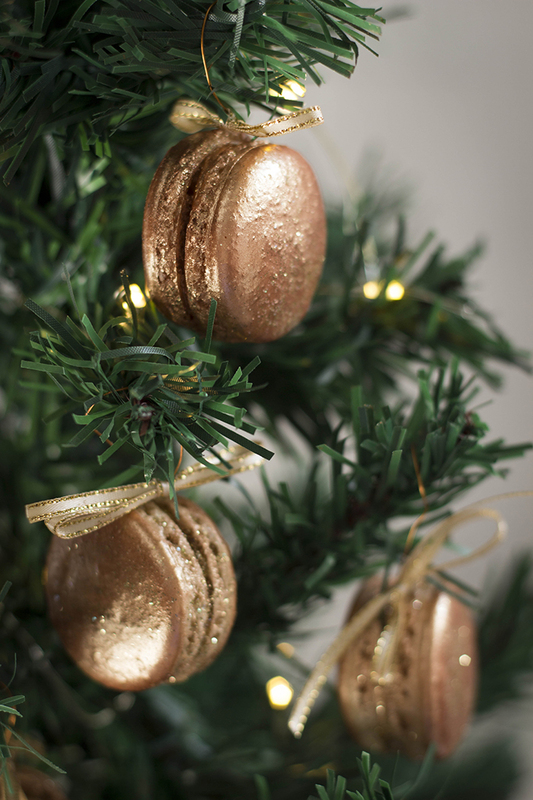 TIP To turn the macarons into tree decorations, insert a long piece of wire with a hook at the top into the macarons while sandwiching them. Allow to set before hanging them up with ribbon or thread.